As part of our ongoing effort to utilize products that are efficient, innovative, and environmentally responsible, AV Strategies has invested in new Elation LED Blinders to add to our national lighting inventory. While blinders have been around for a long time, the new CUPIX Blinder WW4 from Elation is a marked improvement over older technology incandescent fixtures. Our new 4 light blinders feature a weatherproof housing, individual control over each of the 4 lights, and a decay feature. Lighting techs no longer have to pre-program a fade into our LED blinders, as the desirable decay effect is built-in to each of the fixtures. 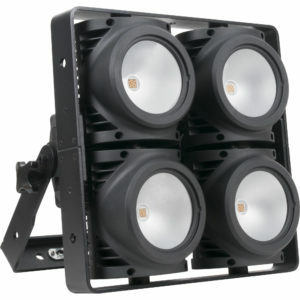 They also feature long life 100W Warm White 3,200K COB LEDs, a 62° beam angle, individual control of each COB module, manual pan focus, variable and selectable dimming curves, strobe effects, flicker free operation for TV and Film, 3pin and 5pin DMX and powerCon in/out connections. They also have LCD menu display with 4 button control panel, integrated yoke and side mounting brackets, and a multi-voltage universal auto switching power supply. 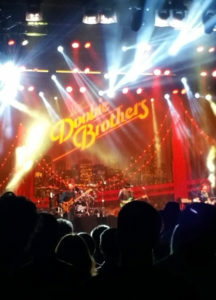 We spec’d these lights for the first time at the PNE last summer for the mainstage which featured bands such as Tom Cochrane, The Pointer Sisters, ZZ Top, Huey Lewis and the News, and the Doobie Brothers. Our strategy of continuously upgrading our inventory with the latest technology in all our departments provides significant benefits to our end customers, a better experience for production companies utilizing our products & services, and it means we are using products that use less energy and reduce our environmental footprint.